Really good show lined up for Labor Day evening at Soundlab. 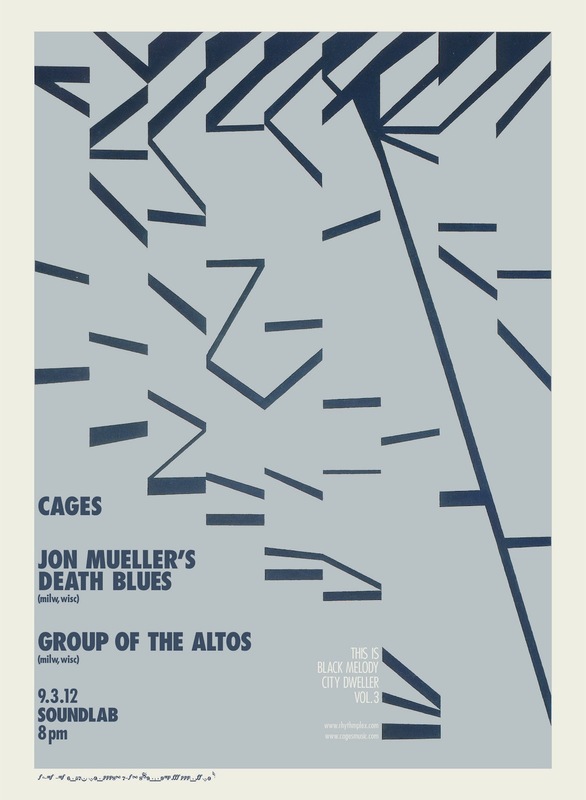 Super talented Buffalo duo Cages is bringing to town some Milwaukee friends including percussionist Jon Mueller (Collections of Colonies of Bees, Volcano Choir). Mueller will be performing with his Death Blues project that Mueller describes as “a multidisciplinary project that addresses the inevitability of death as impetus to become more present in each moment.” See the video below for more on Mueller’s thinking behind the project. Also on the bill is Group of Altos, another act out of Milwaukee. And if you’re not yet familiar with Cages, check out the 2008 live performance in Bloomington below. Singer Nola Ranallo is easily one of the most intense vocalists you will see on stage. Her delivery has a Bjork-like ferociousness while the timber of her voice is wholly unique. Backed by multi-instrumentalist David Bailey, the duo will perform some new material from their upcoming 12″. Should be a great show. This entry was posted on Sunday, September 2nd, 2012 at 9:00 AM	and tagged with cages, death blues, group of the altos, jon mueller, nola ranallo, soundlab and posted in visually sound sunday. You can follow any responses to this entry through the RSS 2.0 feed.